Last night I stopped at the Extra Mart in Lisbon Falls before I left for New Hampshire. I filled up the Jeep with fuel and I ran into a high school friend. We ended up chatting for almost an hour and as a result, my trip home was much later than expected. 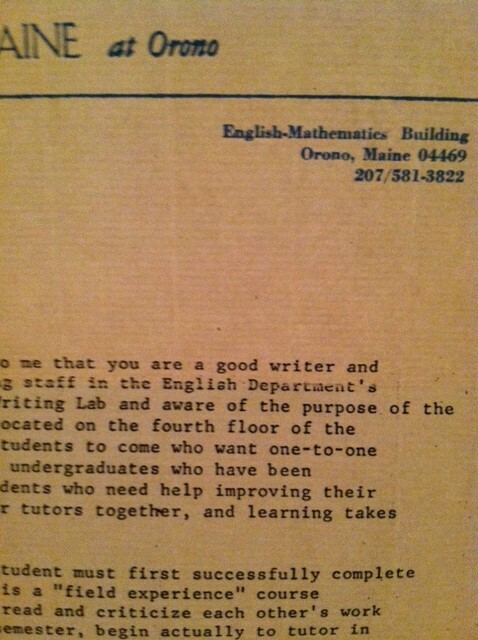 One of your teachers has suggested to me that you are a good writer and may be qualified to join the peer tutoring staff in the English Department’s Writing Lab. It has been my experience that the peer tutor training course not only improves your writing, it gives you practical work experience that could be valuable to you after you graduate. In this same folder of yellowing papers was an undated newspaper clipping about Mark Laroche. Mark had owned a convenience store in the spot where the current Extra Mart sits, aptly called “Mark’s.” A fire destroyed the store, but he quickly rebuilt. During the reconstruction, he set up a “temporary store” on the same location and this was the theme of the newspaper clipping. Apparently, this event was meaningful to me because I wrote a story outline called “The Temporary Store.” As I sip my second cup of coffee, I share it with you. The narrator is a student at Snyder College. Every day, he commutes from his home in Trinity Peak to Snyder. On his route is a prosperous twenty-four hour store. The people who work there are listless, yet there is something about the store that keeps the narrator coming back. The coffee tastes like hot dishwater with tree bark in it. It is replaced by a trailer which will take the place of the former store. The narrator becomes convinced that there is some sinister aspect of the store that must be deciphered. To no avail, he tries to ease his mind by making frequent stops at the store, buying hot “spuds” and play Pac-Man. He discovers nothing. Following an accident caused by craning his neck to look at the store, he is bedridden and unable to make his daily trips. When he is able to travel again, the temporary store is gone. It has been replaced by a shiny, modern convenience store. He walks in and everything except the location of the store is the same. He gets into his car and drives to Snyder College, realizing that the mystery of the temporary store was all in his head. On a Cuppa Cuppa kind of day, I’m glad I didn’t accumulate life-destroying college debt in my four years at the University of Maine at Orono. Three cheers for Snyder College! This entry was posted in Back to School and tagged I borrowed $8800.01 to attend UMO, Mark Laroche, Pac Man, The Writing Center, University of Maine at Orono, what is the value of a college education. Bookmark the permalink. You did accumulate quite a lot of kindling, though. Spuds. Those were the poison that lured us from the high school across the street. Now we make them in the oven here at home. LP! I thought this post would lure you to talk more about education, debt, and high finance. I must be losing my charm! Potatoes are surprisingly easy to grow here in New England. Note to self: plant some in 2014.